According to the National Environment Agency, about 790,000 tonnes of food waste was generated in Singapore in 2014 and only 13% of this waste is recycled. Consumers can reduce food waste on an individual level, but can also play an important role in advocating for greater efforts and best practices in food waste reduction by the F&B sector. With this premise, the study aims to understand consumers’ attitude towards food waste and how they hope F&B companies (including retail shops selling food; bakeries; cafes; restaurants; food courts; canteens; hawker centres; markets; supermarkets; and caterers) can contribute to the reduction of food waste. 90% of respondents are concerned about the food waste generated in Singapore (agree or strongly agree). 90% of respondents are concerned about the food waste generated by F&B companies (agree or strongly agree). More than 83% of respondents disagree or strongly disagree that it is acceptable for F&B companies (including bakeries, supermarkets, restaurants, cafes, food courts, and caterers) to throw away unsold, excess and near-expiry food that is still safe for consumption. 95% agree or strongly agree that F&B companies need to do more to reduce food waste. Majority of the respondents stated that they would encourage F&B companies to adopt these food waste reduction strategies: Donate unsold, excess and near-expiry food that is still safe for consumption to the charities (91%); Sell unsold, excess and near-expiry food that is still safe for consumption at a discount (84%). Close to 50% of the respondents named NTUC FairPrice as a company whose food waste reduction strategy would be of interest to them. The second most named company is BreadTalk with 37% of the respondents, and the third company is McDonald’s (26%). 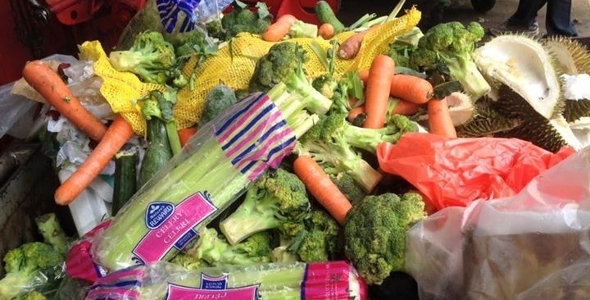 Respondents are most interested in how retail supermarkets reduce food waste, with NTUC FairPrice, Cold Storage, Giant and Sheng Siong among the 10 most named companies. The respondents indicated that they are willing to support F&B companies which adopt strategies to reduce food waste by helping them spread the word for their efforts (81%). In addition, 70% of the respondents expressed that they will buy more of the company’s food products or patronise the company’s outlets again, and 67% will continue to do so even if there are competitors. If a F&B company donates unsold, excess and near expiry food to the charities and needy, the respondents will show support by telling others about the company’s efforts to reduce food waste (86%), or buy more of the company’s food products or patronise the company’s outlets again (70%). Please refer to the attached survey report for more details. The Chua Thian Poh Community Leadership Programme (CTPCLP) aims to develop Singapore’s next generation of community leaders. Each year, a small number of NUS undergraduates, majoring in various disciplines, will be admitted into the CTPCLP as fellows. These future leaders will not only be intellectually engaged in social and community issues, they will also have the opportunity to work hand in hand with our partnering social service organizations, social enterprises and government agencies to address social and community challenges in Singapore. Zero Waste SG is a new not-for-profit organisation and non-governmental organisation dedicated to help Singapore eliminate the concept of waste, and accelerate the shift towards zero waste and the circular economy. We will promote education and engagement on the 3Rs (Reduce, Reuse and Recycle) among individuals and households; increase waste minimisation and recycling among businesses and organisations; and reduce specific waste. Zero Waste SG also manages the Save Food Cut Waste campaign, which is a ground-up movement educating individuals, businesses and organisations in Singapore about the environmental and social impacts of food waste, and encouraging everyone to take action in reducing food waste. What about the Singaporeans that don’t finish their plates in hawker and food centers? I’m amazed, at each lunch time, to see what remain! It’s crazy! So, are they concern about that, or does food waste applies only to companies and not individual. Clean your plate first, then stick your nose on your neighbor’s. I’m very disappointed with the size of serving at our food court here . Resulting in people like myself having mad to pay for something I cannot finish .They should have an option for smaller serving at a lower price for smaller eater.But I know their main purpose is to make money . They don’t care if we could or not finish as long as we pay to cover the overhead .. I am a Mechanical Engineering student currently working on a project to design and manufacture a domestic bottle & can crushing device for Singapore market. It would help to significantly reduce the volume of waste and could be placed next to your other kitchen appliances. If you are a Singapore Citizen or Permanent Resident in Singapore, could you please complete a short survey regarding this device? Only 8 simple questions, hence should not take more than 5 minutes of your time. Also, could you please pass this survey to your friends, colleagues, etc. Every single response is greatly appreciated. Thank you!